Or is it to satisfy that warm feeling of aspiration that simmers within? We all have a fire that burns inside of us. This fire is our desire. Our intention, otherwise known as Tapasya. Tapasya in Sanskrit literally means "produced by heat", and this refers to a personal endeavor of discipline undertaken to achieve a goal. Tapas is based on the root Tap meaning "to heat; to give out warmth; to shine; to burn". The term evolves to also mean "to suffer; to mortify the body; undergo penance in order to burn away past karma and liberate oneself." For the sake of today's blog, let's focus on the term Tapas meaning "warmth, heat, and fire". We can stoke the fires of our intentions and create good actions. A variety of cultures and sects experience tapasya in their own unique ways. Many spiritual practices are rooted in this word. Buddhists refer to tapasya in the observance of self-discipline and meditation. In Jainism, tapasya means practicing austerity. Different traditions within Hinduism practice solitude, self-cleansing, asceticism, and meditation all as a means to achieve moksha, or liberation. The above descriptions may seem extreme, and you may have no spiritual connection to those practices, or maybe you do, but they only illustrate how we all have an inner fire driving our intentions. As the seasons are changing, and we have just under one hundred days until the new year, I am really examining the ways I feed my fire. Am I feeding my fire with proper sleep and healthy foods? Am I feeding my fire with good relationships and associations? Are my actions in alignment with my goals and intentions? How am I satisfying my desires? Are my desires moving me forward or keeping me stuck? Tapasya. 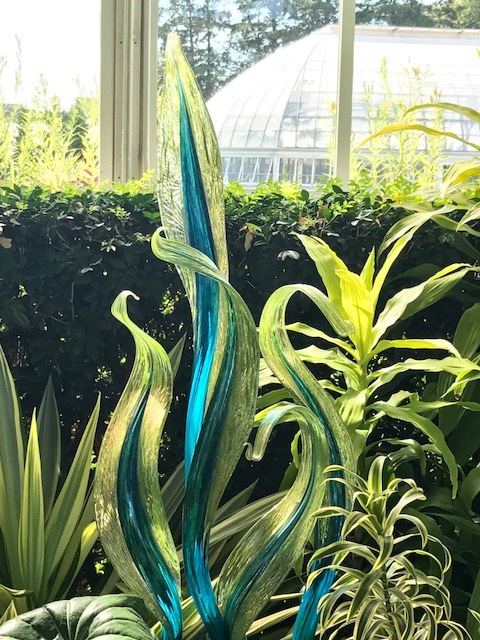 In the spirit of fire and transformation, I went to the New York Botanical Gardens this weekend to see the Chihuly Glass exhibit. Glass blowing has always been mind-blowing for me. By heating ordinary sand we are rewarded with extraordinary creations. Glass blowing is a study in temperature control, heating and cooling the glass to bend and take on shape. 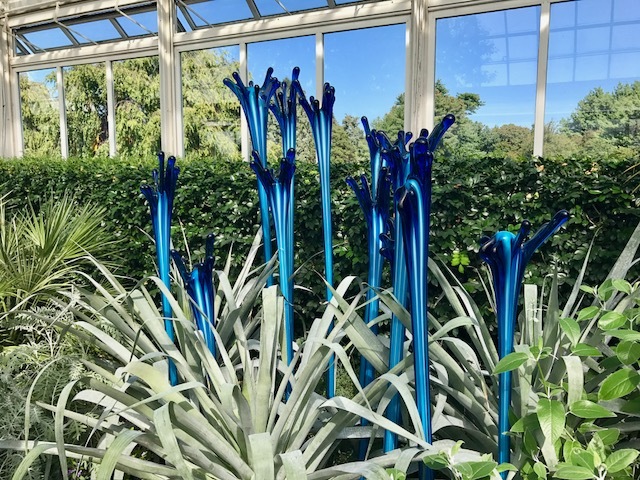 There are Chihuly exhibits happening all over the world -- there's even one near my hometown in Missouri at the Crystal Bridges Art Museum. I highly recommend seeking out this magical glass of Dale Chihuly. What a treat to see his creations up close and in person. The memory of these glass installations will stay with me for a long time. They will stoke and inspire my inner intention and remind me how something so powerful, fire, can be controlled to create something delicate and beautiful. Heat is a tricky thing. It can make us feel cozy, safe, and warm, but too much heat can burn and suffocate us, making us feel trapped. As we greet the last season of the year, I invite you to check in with your own tapasya and to stoke the inner fire of your desire with the perfect degree of intention. 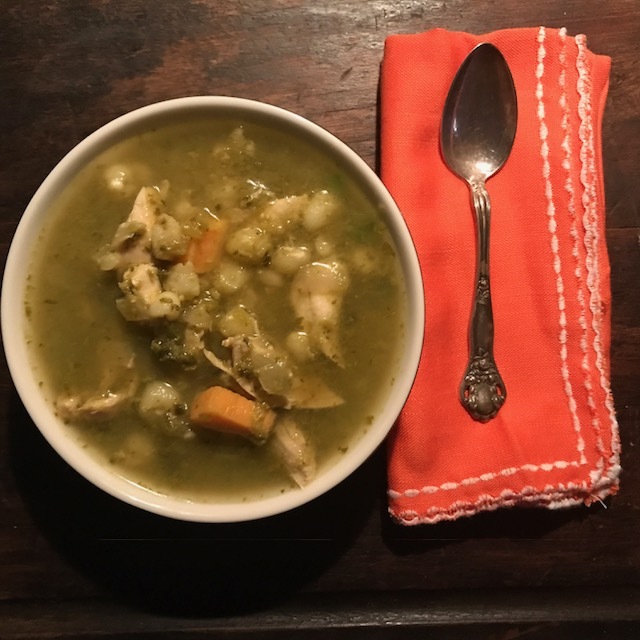 I've made my first stew of the season (despite temperatures reaching 90° here in New York City,) to welcome the eventual cooler days. 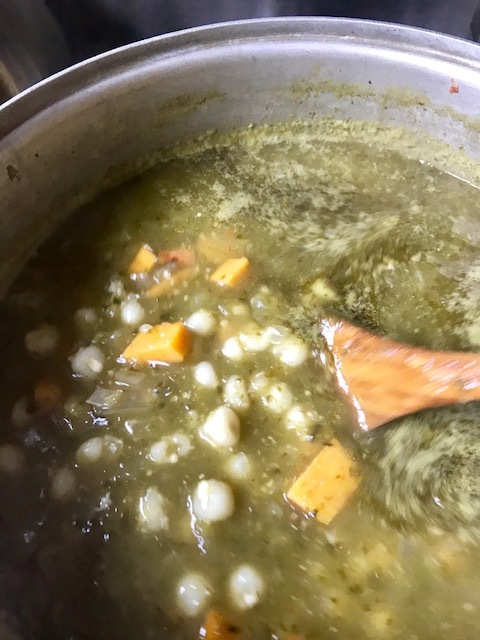 I used the heat of green chilis to make Green Posole. 1. In a large soup pot, bring the chicken stock to a boil. Add the chicken breasts, cover and simmer over very low heat until they're tender and cooked through, about 25 minutes. Transfer the chicken breasts to a plate and shred the meat. 2. In a food processor, combine the tomatillos with the onion, poblanos and jalapeños, garlic, chopped cilantro and oregano. Pulse until coarsely chopped, scraping down the side. With the machine on, add 1 cup of the cooking liquid and puree until smooth. Season the tomatillo puree with salt and pepper. 3. Pour the green sauce into the cooking liquid in the pot. Add the hominy and bring to a simmer over moderate heat. Add the shredded chicken to the stew, season with salt and pepper and cook just until heated through. Serve the posole with grated cheese and lime wedges.